dorado, Cat. llampuga, L. Coryphaena hippurus, Eng. n. Dolphin fish. This is a large fish resembling the dolphin. It is silvery-blue on top and with an orange-yellow stomach but looks gold in the water for which it received its name. Normally, it stays on the Mediterranean coast for the temperatures, especially from spring to the end of summer. Also, it is found in the eastern Atlantic from the northern part of the Iberian Peninsula to the south. It is a rapid swimmer and can cover great distances. Often, it serves as the pilot fish for schools of other fish. Principally, it eats flying fish. Dolphin fish is eaten fresh. It is the only fish documented on the Spanish coasts prior to the reconquest pushing the Muslims out of Spain prior to 1492. It appears to have been more commonly eaten in Catalonia than in Castile. It remains popular today. Scale the dolphin fish. Remove head, fins and tail. Slice it open it, slide out the bone and wash it. Leaving the skin on, divide it into two parts. Sprinkle the inside with dill, salt and drizzle 1 tbsp vinegar over the meat. Fry both parts on both sides. When done, place the fish on a serving dish. 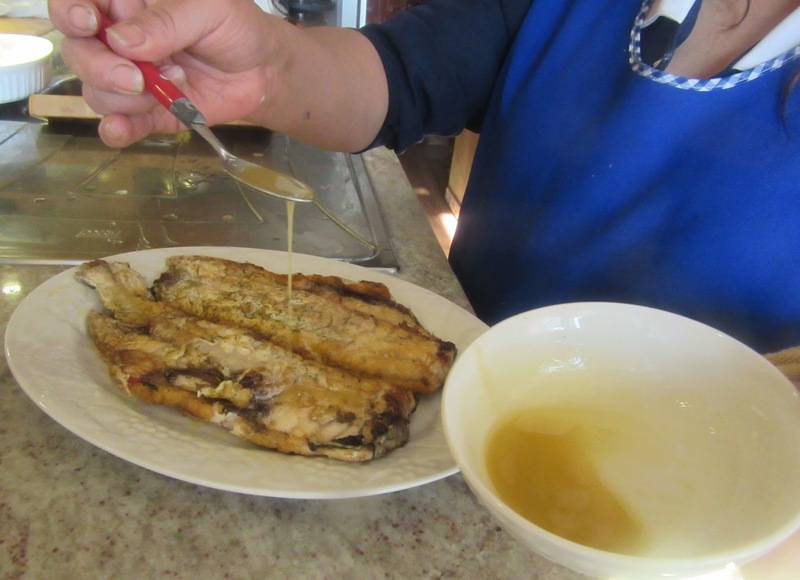 Put 1 tbsp hot olive from frying the fish in a bowl with 1 tbsp vinegar. Beat well drizzle it on top of the fish. No Fish Lover Can do Without! Put parsley leaves in a food processor with freshly squeezed orange juice. Grind. Add the oil from frying the fish and 2 tbsp vinegar. Mix well. Pour into a small pitcher and serve hot with the fish. Note, Nola maintains that the pelaya and dolphin fish are no good except fried. 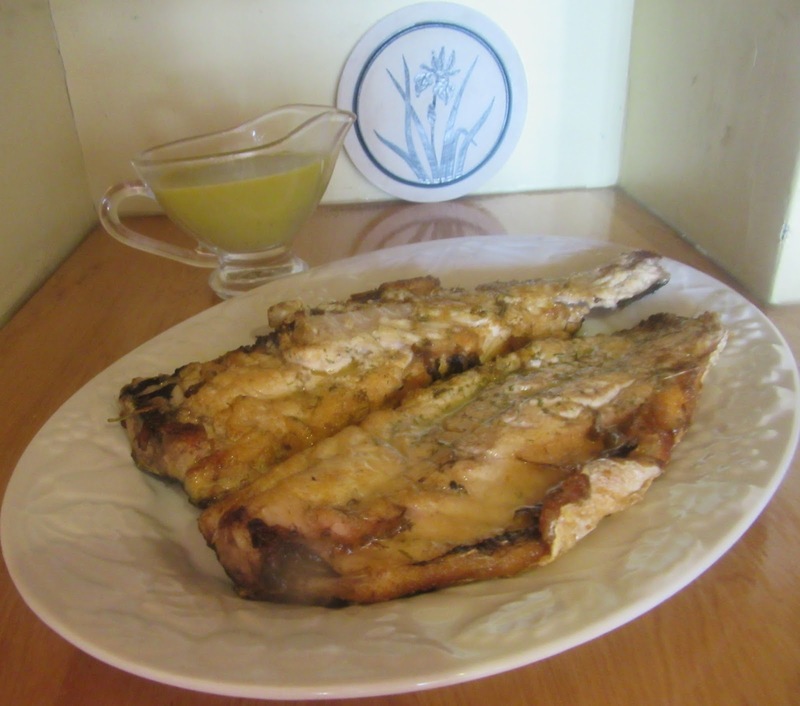 Hake, he continues, is a fresh fish that is eaten with pepper, and chopped parsley on top. Also it is eaten with parsley sauce. It can be is fried in oil with pepper and orange juice. It can be eaten in pies with pepper and oil; and at times it is baked in a casserole with oil and spices. Brighid explains this is Coryphaena hippurus, the common dolphin. Many people know it by the Hawaiian name of mahi-mahi. It is not the familiar sea mammal. 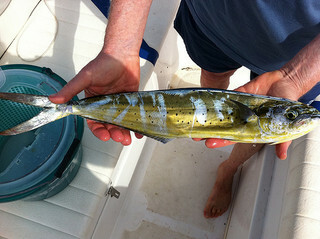 A 2 lb stripped mullet was used as dolphin was not available. The instructions read to mix the vinegar with the oil. That would make the oil spit to the point that the cook could not be near the frying pan. This is an example of how scribes recording these recipes had no knowledge of cooking.